The annual Pheasant Life Cycle can be broken up into four major phases that include Nesting, Brood Rearing, Foraging, and Winter Survival. These phases occur roughly throughout spring, summer, fall, and winter. During each phase the pheasant faces different challenges. 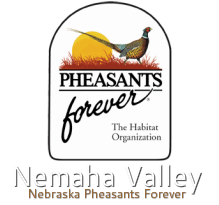 In fact, just in Nebraska the first reports of Pheasants came in the years of 1900-1904. Those pheasants were reportedly shot in southeastern Nebraska; they were stragglers from early stocking in Kansas. The earliest stocking attempts by the Nebraska Game and Fish Commission, as the agency was then called in, this occurred in 1915. For the next 10 years, additional birds were released each fall, some by private stocking. The pheasant’s adaptation to the climate of Nebraska and to the habitat associated with grain culture on the plains nearly perfect. By 1926, pheasants were so abundant in Howard County that 15,000 were trapped and distributed in 49 other counties. About a year later 30,000 birds were trapped in Howard, Sherman, and Valentine and released into 76 different counties of Nebraska. Between 1937 and 1949 the population grew tremendously to about 130,000 birds. Today in Nebraska research is being conducted for Pheasant abundance. Historically we have 1 million birds and 500 pairs. All fertile eggs in a nest hatch within 24 hours of one another. Shortly after hatching the hen leads the chicks to brood cover, i.e., alfalfa or other fields of forbs that are saturated with grasshoppers and other insects needed in the chicks diet for rapid growth. More than 90% of a chick’s diet is insects during the first week and 50% during the first 5 weeks. During the first few weeks the brood will stay relatively close to home (10-20 acres surrounding the nest site), but eventually expand their home range to nearly 70 acres. At 3 weeks the chicks are capable of short (150ft) flights, and by 8 weeks they can sustain adult-like flights. The hen will remain with the brood through 8-10 weeks, but even under her watchful eye half of the brood will be lost to mortality. By the time the young pheasants reach 16 weeks of age, their plumage is virtually indistinguishable from adults. As fall approaches in late September, the juvenile and adult birds begin a feeding binge as to build up fat reserves that will be needed throughout the winter. Pheasants will eat many types of grain and seeds, but in these fall months, corn will compromise more than half of their diet. The foraging season also coincides with that of hunting, which will claim approximately half of all roosters. Well-placed food plots establish safe foraging patterns, restrict unnecessary movements, and provide dependable food to carry female birds through harsh winters in good condition. Winters in the upper Midwest represent the time of greatest mortality for pheasants. Rarely do pheasants freeze or starve, but often the blanketing snows and frigid temperatures reduce their health or concentrate them in limited habitats where predators are the direct cause of mortality. Core Wintering areas can be used in areas where there is sufficient nesting cover to increase over-winter survival and ultimately bring more hens, in better condition, into the nesting season. Rarely if ever does a pheasant die of old age, in fact, the average lifespan is less than 1 year. The pheasant is a prey species and must face 4 major sources of mortality beginning the day it is laid in the nest as an egg through the day it dies.